The price here is being called "crippling" for Greece, which must roll over $72billion in debt this year, likely at these much higher yields than they've enjoyed over the past decade. 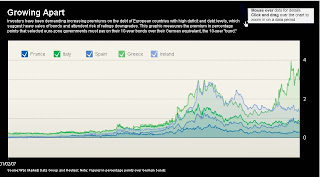 The Greeks are horrified at having to offer double the yield that Germany does on it's ten year debt. That is similar to a 20year old burger flipper being outraged that the credit card company charges him a higher rate than the owner of the burger franchise...they're simply different credit risks. The WSJ put out a marvelous piece yesterday on the total laugh-fest that was the "austerity" required for Greece to gain acceptance into the EU monetary union. It has been revisions and accounting fraud from day one. A forecaster you MUST be watching. Did the last decade of CAPEX pay off for the Dow? The BS from the BLS is better than expected.